Alibaba Group announced on December 24 that it plans to hand over management of the Tmall Supermarket fresh food section to its Hema Fresh supermarket division. Currently, the Tmall Supermarket fresh section is being operated by Alibaba-invested company Yiguo. 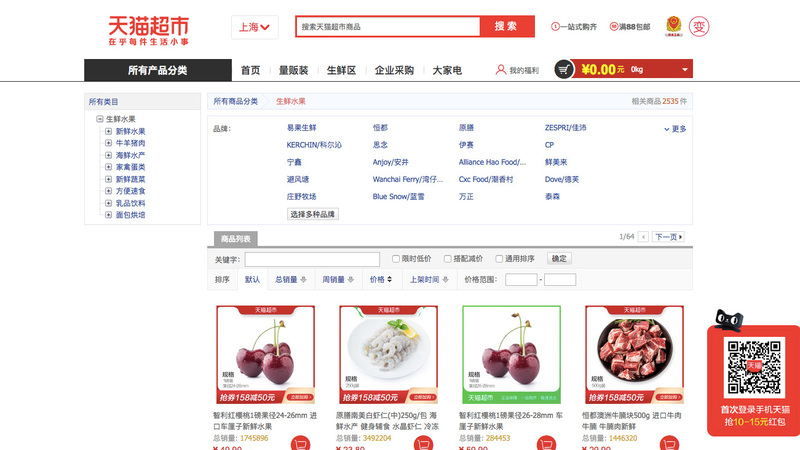 The Tmall Supermarket fresh section offers delivery of a range of products like fruits, seafood and meat to customers living in select cities in China. Unlike other parts of Tmall, where merchants operate their own shop fronts and fulfill orders independently from Alibaba, fulfillment of orders from the Tmall supermarket are managed directly by Tmall. Widespread media media reports in China stated that the Tmall Supermarket fresh section handover was part of an effort to consolidate consumer-facing fresh food sales under Hema, while letting Yiguo focus more on developing its fresh foods supply chain and cold-chain logistics capabilities. "Yiguo will concentrate single-mindedly on bolstering the capabilities of organizations within the Alibaba ecosystem, including Hema, RT-Mart, Tmall Supermarket Fresh and Eleme, consolidating its position as a data-driven, complete supply chain cooperative platform," read one article posted to Sina.com, which referred respectively to Alibaba's wholly owned or invested small-format "new retail" supermarket, hypermarket, fresh ecommerce channel and food delivery service. "Hema, meanwhile, will provide even more consumers with a unified online and offline offering of high quality fresh goods and services,” continued the report. “In addition to a nationwide retail store presence, Hema will now be responsible for operating Tmall Supermarket fresh." Media reports also stated that Yiguo and Hema deepen their collaboration on Alibaba’s fresh food initiatives, which each focusing on its aforementioned core strengths..
Yiguo started out in 2005 as a B2C fresh fruit ecommerce company. Today it offers a range of fresh and frozen foods across multiple sales channels, including its own app and the Yiguo Tmall shop, which will assumedly not be affected by the recent announcement of Hema's taking management of the Tmall Supermarket fresh section. Yiguo also now has two divisions, ExFresh and Winchain, devoted to fresh supply chain services and cold logistics. Alibaba is a major shareholder in Yiguo, having put in several rounds of investment over the years, including a $300 million investment in 2017. Suning Commerce Group is another prominent investor in Yiguo. Alibaba launched Hema Fresh in 2015. By the end of 2018 it had already opened 100 stores in cities across China. It is expected to reach 120 stores by the time the Lunar New Year rolls around on February 4. Hema stores are relatively small compared to competing hypermarkets' outlets, and stock a higher proportion of fresh foods. They are highly focused on integrating the online and offline shopping experiences, such as through app-based ordering and free delivery within an hour to consumers living within a certain radius. Hema is competing to win the race for dominance in fresh food "new retail," a term for tech-empowered shopping that was coined by Alibaba founder Jack Ma, and become consumers' go-to brand for daily shopping. Other companies like rival ecommerce giant JD.com and traditional retailers like Yonghui, Carrefour and Walmart are also in the hunt with similar retail concepts.